The 1991 Gulf War was described by the Iraqi President, Saddam Hussain, as “Um El-Ma=arek,” or the “Mother of All Battles.” It turned to be really so in both regional and international contexts. It was the only war, in memory, in which an international coalition of 31 countries fought against one small Third World country. The coalition included the three strongest nations on earth: the U.S., Britain, and France. Moreover, it had unlimited access to the oil wealth of the Gulf states to get the job done no matter how much it would cost. As a result, the war was nothing but carnage and a destruction of Iraq. The destruction not only included the Iraqi military machine but also extended to the Iraqi economy. The cost for humans, both civilian and military, was enormous as hundreds of thousands of Iraqis lost their lives. The ratio of Iraqis who were killed in the Gulf War exceeded World War I and World War II ratios. Thus, the “Mother of All Battles” was really an example of excessiveness in wars. In this chapter, that excessiveness will be analyzed in relation to war objectives, destruction, killing, and costs. As mentioned in Chapter VII, the war option was made just a few days after the Iraqi invasion. The war was planned according to the American military doctrine known as “Airland Battle.” This doctrine ensured using all available resources from nuclear weapons to psychological warfare in order to defeat the enemy. The doctrine was followed in planning the military operations of Grenada, in 1983, and Panama in 1989. The major element in the doctrine is using overwhelming force to achieve a quick victory. By August 25, 1990, a U.S. four-phase war plan had been in place. This included a strategic air campaign against Iraq itself, an air campaign against Iraqi forces in Kuwait, the destruction of the Iraqi Republican Guard forces in Southern Iraq, and a ground attack to eject the Iraqi forces out of Kuwait. The first phase of the war deserves special attention. It aimed at knocking out the Iraqi command and control installations, transportation systems, production and storage facilities, and air defense networks. Eventually, the air campaign aimed at the destruction of Iraq's "centers of gravity," which included the country's military, industrial, and transportation infrastructure. It also included the destruction of essential economic sites such as power stations, oil facilities, roads, and bridges. This meant that the destruction of Iraq was a goal in itself. Thus, ejecting Iraq out of Kuwait was not the real objective of the war. It could have been achieved by peaceful initiatives or by economic sanctions. Rather, the destruction of Iraq as a regional power would allow the U.S. to maintain its control over the Arabian oil, protect Israel's security, remove a potential threat to its allies in the Gulf, and generally affirm America's global supremacy. The U.N. Security Council issued an ultimatum to Iraq to withdraw its forces from Kuwait before January 15, 1991. As Iraq did not do that, the air campaign started 24 hours after the expiration of the ultimatum (January 17 Eastern Time) and continued for 38 days. In order for the planned destruction to happen, Iraq was bombarded with an enormous number of explosive devices that reached about 88,500 tons. That was equivalent to 7.5 nuclear bombs like the one dropped on Hiroshima at the end of World War II. The total number of sorties was 108,043, of which 83.6 percent were flown by the U.S. air forces, 6.5 percent by Saudi Arabia, 5.1 percent by Britain, and 2.1 percent by France. This shows that it was basically an American war. Actually, the American forces constituted about 86 percent of the whole coalition forces, which came to Saudi Arabia, which was 540,331 out of 630,282. This resulted in the fact that the U.S. had most of the coalition's “small” losses: 146 deaths and 338 injuries, while the second highest losses were in Saudi Arabian forces: 38 deaths and 175 injuries. Thus, the war was basically planned and fought by American forces and weapons. The coalition air forces dominated the battlefield from the first day of the war. Iraq=s major reaction was firing 88 missiles: 42 at Israel, 43 at Saudi Arabia, and three at Bahrain. Otherwise, it almost did nothing except receiving aerial hits. While the coalition military leaders dismissed these missiles as unimportant, political leaders considered them as very dangerous because about half of them targeted Israel. The Iraqi missiles were modified from the basic Russian Scud missile, which had an original effective range of 200 miles. Two modified versions were produced with longer reach: Al-Hussain with a range of 450 miles, and Al-Abbas with a range of 600 miles. A third modified version was Al-Abed with a range of 2000 kilometers (1243 miles). The major fear was using these missiles to deliver chemical or biological weapons during the war. Though this did not happen, Secretary Cheney and General Powell contemplated the use of tactical nuclear weapons in case the missiles were used for that purpose. The Israelis also had the same intentions against Iraq. General Barak, the Israeli Deputy Chief-of-Staff, conveyed a message to the Bush administration that Israel was willing to use nuclear weapons if the Iraqis used chemical weapons. Furthermore, the Bush administration was ready to destroy the Iraqi dams on the Euphrates and Tigris rivers to flood Baghdad. Had this happened, it would have caused a horrendous number of civilian casualties. However, Iraq decided not to use chemical weapons in spite of the fact that there were 30 chemical warheads for Al-Hussain missiles, ready to use during the war. That wise Iraqi decision prevented the doomsday scenario of mass destruction adopted by the Bush administration and the Israeli government. In response to the Iraqi missile attacks, Israeli pressures intensified on the Bush administration. The Israelis wanted to participate directly in the air campaign against Iraq. The Bush administration persuaded them to give up the idea in order to keep the coalition intact. After all, by not retaliating, they achieved their “larger strategic objective -- the destruction of (Iraq=s) military capabilities.”  But this was not good enough for the Israelis. That was why Secretary Baker called Shamir pleading with him: “Don=t make it more difficult for us to do the job for you,” thus admitting that the destruction of Iraq was being done for the sake of Israel. The Israeli government was still not content and asked that the Defense Minister, Moshe Arens, be briefed about results of the air campaign. He came to Washington at the beginning of February 1991, where both Cheney and Powell reported to him how the air campaign was going. However, he expressed his belief that Israel could do a better job in destroying the Iraqi missiles. At that point, President Bush felt irritated because the Israeli hard-liners “seemed to offer so little thanks for what we (the Bush administration) were trying to accomplish for them.” Thus, President Bush, like Secretary Baker above, admitted that the destruction of Iraq was being done for Israel. The Israelis insisted on that Israel receive direct intelligence from the U.S. satellites so that the Israeli military would have instantaneous information on Iraqi deployment. The Bush administration agreed and began sharing intelligence with the Israeli defense headquarters. In addition, the Israelis demanded that the headquarters of the Central Command in Riyadh receive a team of their officers to participate in decision-making there. This was rejected by the Saudis. As a result, the Central Command had to assure the Israelis by removing one-third of the allied planes from the air campaign and diverting them to western Iraq to hunt for the Iraqi missile launchers, within six minutes of firing. Moreover, the Israelis wanted to send their planes to destroy several sites in Iraq though some of them were already destroyed and others were just sand dunes. They were finally persuaded not to insist on that because the coalition forces were doing the job for them. However, supporters of Israel in Washington continued their pressures on the administration. These were the hawkish politicians who gave Cheney and Powell a hard time, according to General Schwarzkopf. Although the Iraqi missiles did not demonstrate a genuine military threat, they had a serious impact on the Arab-Israeli conflict. For the first time, an Arab state could develop and use such strategic weapons to reach Israel. This happened in spite of the attempts of supporters of Israel to maintain an Israeli monopoly on these weapons in the region. Before the war, Israel bombed, shelled, and raided countless Arab towns and villages in Palestine, Egypt, Iraq, Jordan, Lebanon, Syria, and even as far away as Tunisia, but except for an occasional katyusha rocket on a border settlement, its own population centers have never come under any Arab attacks. The Iraqi missile attacks on Israel ended the Israeli myth of invincibility that was created and promoted to discourage Arabs from thinking about attacking Israel. Furthermore, the missiles could have been much more lethal had they been provided with chemical weapons. The apprehension that these missiles may carry chemical weapons caused a severe psychological impact on the Israeli population. Actually, this might have been a major factor that has contributed to dragging the Israeli Likude government of Shamir to come to the negotiating table afterwards. These missile attacks, together with the Palestinian Uprising, might have convinced the Israelis that only a just peace in the Middle East can guarantee their security, as argued by Shimon Peres. The coalition forces were in complete control of the battlefields throughout the air campaign. This meant that the air campaign was successful in achieving the war goals. The evidence was in the various Iraqi offers of unconditional withdrawal. In spit of that, they were denied any chance to withdraw. The Bush administration was not content of the destruction inflicted on Iraq and its forces in Kuwait. Actually, it did not want to “eject them out of Kuwait.” Rather, it wanted to destroy them there. That was why President Bush ordered the unnecessary ground war. As General Schwarzkopf pointed out several times, a major objective of the ground war was the destruction of the Iraqi forces so that they would never be used again. There were at least five major Iraqi offers of withdrawal before the ground war, all of which were rejected by the Bush administration. These were all presented to the administration through Soviet initiatives. The first of these initiatives was presented by the Foreign Minister Bessmertnykh to Secretary Baker during their meeting on January 26, 1991. Baker rejected the initiative because it would allow the Iraqis to withdraw their military forces intact. On January 28, Baker agreed to two separate but joint statements: one on the Gulf and the other on the Arab-Israeli conflict. This angered the President and Scowcroft because they saw it as a linkage and Baker admitted that it was a “careless error” that did not mean a change in the policy. The fourth initiative was on February 18, 1991 during Aziz=s visit to Moscow. Iraq agreed to start withdrawing its troops unconditionally the following day after a cease-fire, in exchange for not being attacked while withdrawing. It was also rejected by the President as an unacceptable solution. It was absolutely impossible for the Iraqis to do what President Bush wanted them to do. Logistically, the Iraqi leadership could not communicate that fast with its troops in Kuwait after the destruction of its communications with these troops. Even if it could, it was impossible to complete withdrawal within a week. There was actually not enough time for them even to announce their answer to the ultimatum. Thus, the ground war started on February 24, 1991 and lasted until 8 a.m. of February 28, 1991, in spite of the Iraqi withdrawal, which was officially announced and started around midnight of February 25. To achieve the goal of destruction, the ground war plan required outflanking and destroying the Republican Guard by VII Corps. It also required the blocking of the Iraqi getaway routes in the Euphrates valley by XVIII Airborne Corps. The latter requirement was made in order to make sure that the retreating Iraqi forces are cut off and killed. "It comes down to a question of lives," I told Powell, "We have probably inflicted a hundred thousand casualties on the Iraqis at the cost of one hundred for us. Why should we inflict a hundred and fifty thousand casualties?" Cheney said, "I don't see why the Soviets have to be involved at all." I answered him saying, "For what it's worth. Saddam has to work through a middleman because that's the way Arabs do business. He will never negotiate directly. By working through a broker, he saves face and then afterward, of course, no matter what he has agreed to, he can make any claim he wants because he never talked to his enemy." In spite of this attempt from Schwarzkopf to prevent the ground war, the Washington hawks refused it because this might have saved some of the Iraqi forces and their equipment from destruction. In fact, the President’s National Security Advisor, Brent Scowcroft, admitted that he was as impatient as the President to begin the ground campaign in spite of the reluctance of military commanders and Secretary Baker. It is unbelievable that a war is extended arbitrarily so history books can mention it as the five-day war, that is one day shorter than the 1967 six-day Israeli war against Arabs! Thus, in order to achieve that propagandistic goal, tens of thousands of Iraqis had to be killed. "American fighter pilots were returning from their missions talking about the "turkey shoot" of Iraqis desperately fleeing north along what became aptly known the Highway of Death. These comments were certain to be followed in short order by grisly news photographs of the carnage. The Soviets had furiously sought to head off the ground war. Now there were genuine fears that they may fracture the coalition by calling on the Security Council to halt the continuing SLAUGHTER. Back home, the thought began to resonate that this war was about to become UN-AMERICAN -- that it was, perversely, too easy (emphasis added) and therefore must be stopped." All this was happening in spite of the Iraqi announcement of withdrawal from Kuwait and the start of actual withdrawal at 2:15 a.m. of February 25, which was 46 hours after the start of the ground war. Neither the official announcement nor the actual withdrawal helped the retreating Iraqi forces. This was simply because the destruction and slaughter were the real goals of the ground war. When General Schwarzkopf gave instructions to General Gary Luck, the XVIII Airborne Corps commander, he told him: "Your mission is to inflict the maximum destruction on the Iraqi military machine. You are to destroy all war-fighting equipment. Do not just pass it on the battlefield. We don't want the Iraqis coming at us again five years from now." Of course, when the equipment was destroyed, soldiers were destroyed too. Inside Iraq, the carnage was more severe. As planned, XVIII Airborne Corps with the 82nd Airborne Division and a French light armored division penetrated deep in western Iraq. The 101st Airborne and the 24th Infantry divisions moved straight north heading for the Euphrates River valley. VII Corps with the British 1st Armored Division launched the main attack that destroyed the Tawakalna Iraqi Republican Guard Division. The other two retreating Republican Guard divisions, Medina and Hamourabi, were destroyed by the waiting divisions in the East. These also destroyed other Iraqi convoys retreating from Kuwait in the “kill box” between Basrah and the Euphrates. In spite of this admission of excessiveness by the U.S. Secretary of State and the Chairman of the Joint-Chiefs-of-Staff, most of the coalition leaders tried to avoid mentioning the huge numbers of the Iraqi casualties during the air and ground campaigns. President Bush mentioned that the Iraqi troops were “beaten up 50,000 ... and maybe more dead,” in the last page of his account of the war. Some American estimates were as high as 300,000 Iraqi military casualties, others were as low as 25,000. Schwarzkopf’s Deputy Commander-in-Chief, Lieutenant General Buck Rogers, stated that there were about 200,000 Iraqis killed in the war. No matter which one is the true estimate, these were unnecessarily lost lives resulting from an excessive war. There was also a civilian loss of life despite General Schwarzkopf=s claim that civilians were not targeted by the coalition bombs. The destruction of chemical and nuclear installations exposed the Iraqi civilian population to dangers that have resulted in the death of hundreds of thousands of people after the war. In addition to that, conventional bombs represented about 93 percent of the total number of bombs dropped on Iraq. These bombs were 25 percent accurate, which meant that there was a lot of “collateral damage,” or civilian losses. Although many civilians were killed during the war, little has been said about them. In one incident that was reported by the CNN correspondent, Peter Arnett, on February 12, 1991, two bombs hit Al-Ameriya civilian air-raid shelter and killed several hundred Iraqis, most of whom were women and children. However, General Schwarzkopf insisted that the shelter was "a legitimate military target." After his report, Arnett was fiercely criticized by the war hawks in the government and the media. They did not want him to show the American people an aspect of the war that was carefully shielded from them, loss of human lives particularly civilian ones. He demonstrated that he was different from the majority of journalists who covered that war. Most of these journalists accepted censorship and reported what they were allowed to see or report on. Thus, the American people had the slightest chances to watch, hear, or read about the hundreds of thousands of Iraqis who were killed during the war. The enormous Iraqi casualties turned to be a sensitive issue that most political and military leaders of the coalition avoided in their accounts after the war. Although every human life is precious, during the entire crisis and the war, only few hundred Kuwaiti lives were lost. Only a few hundred soldiers from the coalition forces were killed and many of them died because of friendly fire. Only two Israelis were killed directly and eleven died indirectly because of the Iraqi missiles. Therefore, there was no justification for that excessiveness. As a result, a very small number of accounts mentioned the topic. Some of them even tried to do a damage-control job by attempting to make Iraqi casualties look very small. They tried to hide the fact that the war was unnecessarily excessive and extremely overdone. General Schwarzkopf estimated that by January 9, 1991, there were 38 Iraqi divisions (4 less than earlier estimates) in the battlefield. These were composed of 545,000 men, 4,300 tanks, and 3,100 pieces of artillery. By the end of the war, twenty-seven of these divisions were destroyed. This amounted to about 70 percent of them. Assuming that these divisions were equal in number, then the number of soldiers who were killed or injured would be more than 380,000. Thus, General Schwarzkopf=s estimates of one hundred thousand Iraqi deaths during the air campaign and fifty thousands more at the end of the ground were not exaggerations. Other estimates were 220,000, 200,000, and 50,000. However, some accounts attempted to minimize these Iraqi casualties in what amounted to a damage-control effort. Representative Les Aspin, Chairman of the House Committee on Armed Services and one of the few Democrats in Congress who supported the Bush administration in its war option, produced a report for that effect together with Representative William Dickinson. They argued that the number of the Iraqis killed during the air campaign was not enormous. They admitted from the beginning that dependable counts did not exist. Therefore, their estimates relied on counting numbers of Iraqi tanks, armored personnel carriers and artillery pieces. Accordingly, the Pentagon public affairs office B their main source of information -- did some simple arithmetic. The number of Iraqi divisions in Kuwait, which was originally believed to be 42, was multiplied by the number of soldiers thought by intelligence analysts to comprise a division. This resulted in an estimate of approximately 547,000 Iraqi troops. However, after the war, captured senior Iraqi officers reported that many of these units were substantially understrength, which is less than what they were thought to be. As a result, the report concluded that there were only 183,000 Iraqi troops. Of these, the coalition forces captured about 63,000 while the rest 120,000 escaped or were killed during the ground war. In explaining their conclusions, Aspin and Dickenson mentioned that the original figure (assigned strength) was 547,000 but it was later discovered that the estimated understregth was 185,000. This means that the real figure was 362,000 Iraqi troops in Kuwait. What happened to them? The report answered that 17,000 of them were injured and 9,000 were killed during the air campaign, 63,000 were captured, and 153,000 deserted. When these figures are analyzed, it is not difficult to find out that they are inaccurate and unreliable for three main reasons. First, the claim of 153,000 deserters is based on reports of captured Iraqi officers who represented only about 12 percent of the “assigned” Iraqi troops. This is not a reliable evidence that we can use to generalize about the remaining vast majority, 88 percent of the troops. It is likely that many of these were killed and buried inside their bunkers or trenches in the battlefields. Second, the claim of the 120,000 Iraqi troops who escaped during the air campaign or were killed during the ground war is also unreliable. On pages 32 and 34, the report mentioned that they had escaped. However, on page 35, they were described as “escaped/killed during ground war.” The report never elaborated on how many were killed and how many managed to escape. This uncertainty of the report may be attributed to the fact that it was mainly based on “guesses,” and on the hope that the other numbers are accurate. As a result, these estimates did not really represent more than wishful thinking. Finally, these figures did not include casualties inside Iraq during the air campaign and the ground war. Thus doing, the Aspin and Dickinson=s report failed to challenge General Schwarzkopf=s estimates. When President Bush published his memoirs later, in 1998, he seemed more to believe Schwarzkopf=s estimates than the Aspin figures. However, he tried to minimize the Iraqi casualties by mentioning that there were more than 50,000 Iraqi deaths. Another damage-control effort was made by John G. Heidenrich, who worked as a military analyst for the Secretary of defense and the Chairman of the Joint Chiefs of Staff, during the war. Heidenrich=s attempt was more blunt than Aspen and Dickinson=s. He mentioned in the first page of his article that Schwarzkopf=s estimates were nothing but rumors based on the initial “misleading” field reports. Thus, his job was to address “the damage that has already been done” by the Commander of the coalition forces. However, in his damage-control job, he did not support his argument with any official materials from the Pentagon. To the contrary, the figures he used supported those revealed by Schwarzkopf. Instead of relying on official data from the Pentagon, where he worked, he used historical ratios of war casualties to argue that there was a very small number of Iraqi casualties that did not exceed 9,500 deaths and 25,000 injuries. It was a less serious but a sad attempt of hiding the truth from the American people. He mentioned that among the 100,000 Iraqis who were captured, there were 2,000 injured. He could not explain how 98,000 un-injured soldiers could be captured while 23,000 injured soldiers could manage to escape. His other major mistake was his failure to account for the casualties inside Iraq, as a result of the 38 days of the air campaign. In brief, such damage-control attempts were self-defeating and would not stand a little effort of analysis. Even seven years after the war, President Bush admitted that there were more than 50,000 Iraqi deaths during the war. War costs in moral devastation and pain to victims cannot be estimated. Indirect material costs cannot be estimated either. But one estimate of direct material costs of the war reached more than $100 billion. Most of these were paid by Saudi Arabia, Kuwait, and other Gulf states. If the increase in military spending and weapon purchases in these states, after the war, is added together with the enormous Iraqi losses, the result is a huge figure, exceeding $600 billion. The war also contributed to an increase in military spending in the entire Gulf region as well as in the United States. Consequently, the indirect costs include a decrease in socio-economic development in the Gulf and more suffering among the poor in the United States, due to less public spending on health care, welfare assistance, affordable housing, and higher education. 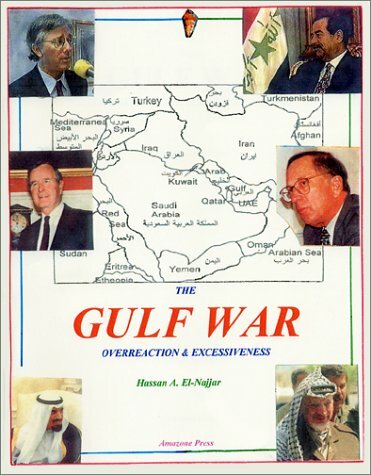 When Secretary Baker toured the Gulf for financial contributions, on September 6-7, 1990, Saudi Arabia and the Kuwaiti government in-exile paid $17 billion each. Moreover, King Fahd gave an undertaking that his country would provide the coalition forces with all the food, fuel, water, accommodation, local transportation and other facilities they needed - at no cost to themselves. In addition to that, the U.S. Department of Defense presented to the Saudis a bill of $2.6 billion, which included $1.9 billion of expenses in airlifting and sealifting troops and supplies. The cost of the American military build-up in Saudi Arabia after that amounted to about $1 billion every month. Thus, by the end of the air campaign, the direct costs reached about $60 billion. When adding costs of the ground war and its consequences, including troops= stay in Saudi Arabia for several more months, the $100 billion figure of El-Rayyes is not a farfetched one. The Saudi support for the coalition troops was “lavish.” It must have been the first war in history in which the troops never missed a meal. Over 750,000 troops were fed each day at Saudi expense. American forces alone were supplied with two million gallons of drinking water each day. The fuel consumption by the two American corps approached 4.5 million gallons each day. This “lavish” spending certainly pleased an important category of the Saudi people, contractors. These were overjoyed as they supplied the “voracious” demands of the U.S. military. That support for the coalition forces cost Saudi Arabia about $10 billion. In addition, the Saudi Ministry of Finance made a direct contribution to the U.S. Treasury of about $14 billion, while further $3.5 billion was paid direct to the treasuries of other countries that helped the coalition military effort. According to the agreed upon plan with the military leaders, President Bush announced the cease-fire on February 27, 1991, contingent on an end to Iraqi fighting, an end to Iraqi missile attacks, an immediate release of prisoners of war, an immediate release of Kuwaiti civilian hostages, and compliance with the UN resolutions. In order to work out details of the cease-fire, the coalition commander met with representatives of the Iraqi military command in Safwan, an Iraqi airstrip 3 miles north of the Kuwaiti border. The Safwan Conference was held on March 3, 1991, in the 3rd day after cessation of hostilities on February 28 (Gulf time). The Saudi commander, Khaled Bin Sultan, who accompanied the coalition commander, Schwarzkopf, was disappointed for two main reasons. First, the conference did not result in the complete surrender of Iraq. He had a vision of a solemn scene like the one in Tokyo Bay in September 1945. As a result, he considered the conference a failure. Second, the Americans disappointed him when they did not insist on that Iraq should be represented by a member of the Revolutionary Command Council. Instead, Iraq was represented by two Iraqi three-star generals, who were even unknown to the coalition intelligence officers. These were Lieutenant General Sultan Hashim Ahmed, the Iraqi Deputy Chief of Staff, and Lieutenant General Salah Abbud Mahmud. In the Conference, the Iraqi representative, General Sultan Ahmed, asked General Norman Schwarzkopf about why the coalition had launched the ground forces into Iraq when "we had withdrawn from Kuwait and announced it on television and radio." Schwarzkopf never answered that question but replied, "we will leave it to history." General Ahmed answered him, "I have just mentioned it for history," too. Within an Arabic context, that may not be understood as a question only. Rather, a complaint about excessive killing of Iraqi soldiers. Secretary Baker summarized the Gulf War outcomes in seven major results. First, it made peace possible between Arabs and Israelis. Second, Arab radicalism had been discredited. Third, moderate Arab governments were strengthened. Fourth, The United States had earned the deep gratitude of all of the Gulf Arabs. Fifth, the war neutralized the gravest threat to Israel=s security. Sixth, the U.S. demonstrated that the Soviet Union was no longer a major player on the world stage. Seventh, the American credibility internationally became higher than anytime since the end of World War II. When these results are analyzed, it becomes clear that the war has benefited the minority ruling elites in the region on the expense of the majority of the Arab masses. First, a decade after the war, a just peace between Arabs and Israel has not been achieved. Israelis have been dragging their feet in an endless process of negotiations instead of a quick withdrawal from the Arab occupied territories, like what Iraqis were forced to do. Second, instead of “discrediting” Arab nationalists (Secretary Baker referred to them as radicals), they could have been won as friends had the crisis been resolved peacefully. Third, the war strengthened Arab dictatorships. It did not lead to the emergence of any democratic governments whether in moderate or non-moderate Arab states. Fourth, while the United States had earned the gratitude of the minority of Arabs in the Gulf, it earned a hostile attitude from the majority of Arabs, everywhere. Moreover, the war increased the material and psychological barriers between the Gulf states and the rest of Arabs. Fifth, the war neutralized the Iraqi threat to Israel, which encouraged the Israelis to continue their occupation of the Palestinian, Lebanese, and Syrian territories. Sixth, the War demonstrated that the Soviet Union could no longer continue playing its role as a superpower that competed with the United States. Moreover, the Soviets sold their will to the U.S. during the crisis, which was an indicator to their downfall within a few months after that. Finally, the war resulted in regaining the American credibility in the world. However, the beneficiaries were the elite autocratic governments, not the majority of people. The war did not promote the American values of democracy, liberty, equality of opportunity, and hard work. To the contrary, the victorious sovereign states of the Gulf continued to represent the opposite of these American values. Although immigrants constitute the majority in these states, the vast majority of them never become permanent residents or citizens. The objective is to limit access to the oil wealth to the privileged citizens, who enjoy that access on basis of birthrights, not qualifications or hard work. The war was truly a misrepresentation of what most Americans stand for. The administration missed a golden opportunity to win the hearts and minds of the majority of Arabs, who live in the less fortunate Arab states. For example, on February 7, Secretary Baker unveiled before the Senate Foreign Relations Committee the idea of a Middle East Development Bank. This bank, he proposed, “would collect funds from the more prosperous countries of the region to finance economic development in the region ... The Middle East, a land of disproportionate wealth remains the only area of the world without (a development bank),” he added. However, President Bush killed the idea. The position of the President to oppose the idea of a Middle East development bank is strange. As a Texan who is close to the oil industry there, he should have been supportive to that proposal. Texan oil revenues are taxed by the federal government and thus shared with other non-oil-producing states of the Union. He took a strange position by opposing that the oil-producing Arab states share some of their oil revenues with the other non-oil-producing Arab states. In fact, he lost a historical opportunity by not establishing that bank. The Gulf rulers could not reject that proposal had he presented it to them after the war. After all, they owed him the continuation of their regimes. Because of that missed opportunity, the Middle East is still polarized as privileged halves and impoverished have-nots. This is a recipe for the continuation of instability in the region that he attempted to end by reversing the Iraqi invasion of Kuwait. It is amazing that the Bush administration adopted a double-standard policy even in inter-Arab affairs. While wealthy Arabs were rescued in the Gulf War, the poor Arabs were denied the opportunity of the Development Bank. Anyway, President Bush did not justify his opposition toward the Bank, but Secretary Baker defended the double-standard policy concerning the Israeli occupation of the Arab territories. He mentioned that when he met with the Palestinian leaders in East Jerusalem after the war, they “made the ridiculous suggestion that the same sort of international coalition that enforced UN Resolution 678 ... should now enforce Resolutions 242 and 338 by removing the Israelis from the occupied territories.” He replied: “If you=re asking that we send in the Eighty-Second Airborne, forget it ... That ain=t going to happen.” He then explained “the difference between 678, which was mandatory and unconditional, and 242 and 338, which called for negotiations involving land for peace. Despite this attempt to justify the double-standard American policy in the Middle East, Baker could not hide the fact that it was still a double-standard policy. If there was one standard in conducting foreign policy, then Resolutions 242 and 338 would be mandatory and unconditional, as well. The Bush administration preferred to go to war, in which hundreds of thousands of Iraqi lives were lost, than resolving the crisis peacefully. Officials in the administration were even willing to use tactical nuclear weapons, which could have led to a disaster of mass destruction in the entire Middle East region. This was prevented only because of Iraq=s wise decision not to use chemical weapons during the war. Had the objective been the Iraqi withdrawal from Kuwait, the crisis could have been resolved peacefully. But the destruction of Iraq turned to be the real objective of the war, which explains the huge loss of Iraqi lives. That destruction removed a potential threat to the balance of power in the region and left Israel as the only regional superpower. In fact, the war strengthened the position of Israel, as the idea of linkage was defeated and the Israeli occupation of the Arab territories extended ten more years. Furthermore, the war resulted in more polarization between the wealthy and the poor in the region. All this happened as a result of the lack of vision in the administration concerning the future of the region. The collapse of the Soviet Union and the Warsaw Pact caught the Bush administration by surprise. The foreign policy experts in the administration were not ready with plans for peace after the Cold War. As the only remaining superpower, America needs to address challenges of peace, which is the subject of Chapter XI. Although “Um El-Ma’arek” literally means “The Mother of Battles,” most authors have used “The Mother of All Battles,” instead, apparently following the first translation. During WWI, there were 135 combat casualties per 1000 troops. The WWII ratio was 156 per 1000. In the Gulf War, 1.3 million troops from both camps were deployed producing an estimated 220,000 deaths. Thus, the Gulf War ratio was 169 deaths per 1000 troops in just 43 days of combat (Marullo, 1993: 8). Even if we consider more conservative figures (150,000 deaths), the loss in human life is still among the highest in history. Bin Sultan (1955: 341, 344). (Bush and Scowcroft, 1998: 486). The exception was the few battles fought by the Republican Guard, in self-defense, while trying to retreat north and east, during the ground campaign. Bin Sultan (1995: 347-48, 354). Timmerman (1991: 267, 365-366) mentioned that Al-Hussain flew 615 kilometers (382 miles). Mcknight (1992: 175) mentioned that Al-Hussain had a range of 650 kilometers (404 miles), and Al-Abbas could fly about 850 kilometers (528 miles). The same nuclear threat was reiterated by the Israeli Defense Minister, Moshe Arens, in an NBC interview on February 3, 1991 (Levrani, 1997: 68). Powell (1995: 486, 503-504, 511-512). Bush and Scowcroft (1998: 468). Baker (1995: 405-406); Bush and Scowcroft (1998: 475-77). Bin Sultan (1995: 391-92, 405, 411). The words “cut off and killed” are Colin Powell’s (Powell, 1995: 509). He probably borrowed them from Brent Scowcroft, who suggested the plan. Probably, Schwarzkopf was referring here to the members of congress who were instrumental in pushing for the passing of the war resolution in Congress, in addition to pro-Israel experts in the administration, and the army of strategy, military, and counter-terrorism experts who overwhelmed the media demanding and arguing for nothing short of the total destruction of Iraq. Bush and Scowcroft (1998: 477). Bush and Scowcroft (1998: 462-463). Powell (1995: 517); Schwarzkopf (1992: 466). Bush and Scowcroft (1998: 487). General Schwarzkopf referred to it as Al-Firdous instead of Al-Ameriya (Schwarzkopf, 1992: 435). Cipkowski (1992: 191); Benn (1998). Aspin and Dickinson (1992: 29-35). Aspin and Dickinson (1992: 33-35). Aspin and Dickinson (1992: 32-35).